However much people bang on about medical improbabilities, long journeys by donkey or by camel, an overstretched hospitality industry, symbolic vegetation or even just the steady movement of the earth around the sun, everybody knows that the real meaning of Christmas is the food – or rather, the feeding of it. The recent examples of (largely Turkish) restaurants opening their doors to the homeless and the lonely show that we know no-one should have to eat alone on Christmas Day, even those who have no particular reason to celebrate it; this is because we know that no-one should have to eat alone ever, unless they want to. Personally, I quite like eating by myself, especially at lunchtime – though not on Christmas Day. No, the food is there to be fed, and feeding – that is to say sharing – is, whether done begrudgingly, lovingly, thoughtlessly as a natural right, or even at all, is a political act. The recent review of Donald Trump’s dreadful restaurant was hilarious, of course, and clearly well-deserved, but the reason it resonates is that someone who doesn’t give a damn about feeding people non-terrible food, and for whom hospitality is merely another opportunity for conspicuous consumption, is obviously unfit to run a country. If he’s going to operate a restaurant simply to extend his brand and to make money, why wouldn’t he operate his government in the same way? 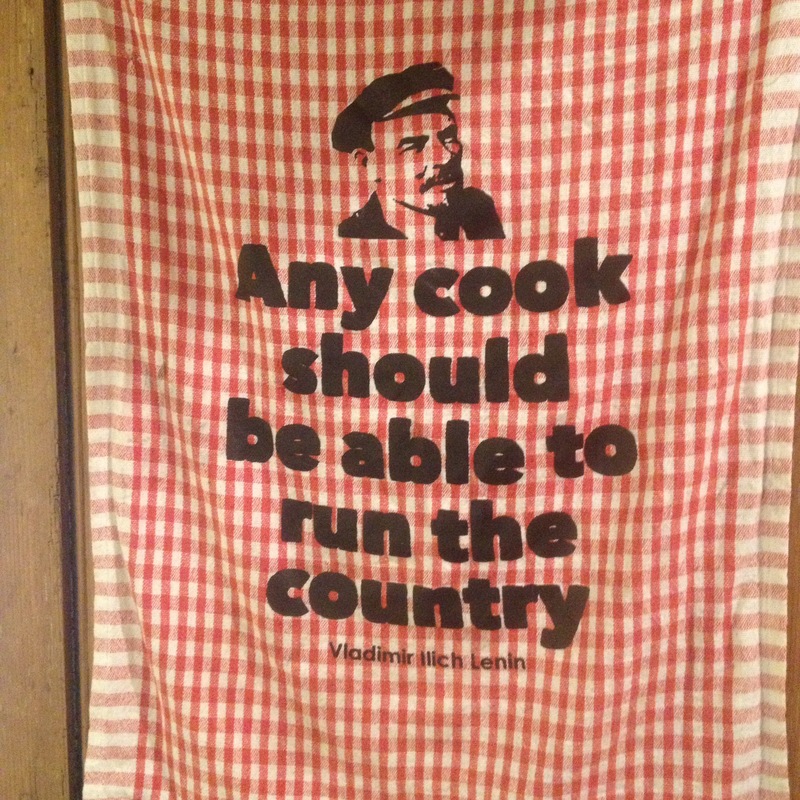 I’ve never been sure if the remark of Lenin pictured above is intended to imply that government should be open to all, even a lowly cook, that the mechanisms of government should be so well-designed that even a cook could step in and run them, or that the particular multitasking-forward-planning-hard-working-selflessly-food-sharing skillset of the cook or chef makes them ideal for the job; if the latter, as I have always chosen to assume, then he must have meant ‘run’ in a bureaucratic, backroom, Mycroft Holmes sort of a way; no-one would want even the most talented and generous of cooks as the face of government. For that you want a maitre d’, or perhaps a world-weary barman. Imagine Trump as a maitre d’, throwing a tantrum when you didn’t order his ‘favourite’ special, ‘accidentally’ spilling wine over your date so he can wipe down her breasts. Imagine David Cameron as a maitre d’! He’d upsell you Champagne and then teabag your soup for a laugh. If Theresa May’s grim rictus greeted you at a restaurant door, you’d back out and settle in at the pub across the road, where it’s warmer, they keep the ale well, and they cook food with the intention to feed. When I was going to sleep, I think the night before last, I had a really good idea for a piece. Today I need to write it, and I have not the slightest idea what it was. Gone. Possibly it was in fact quite a bad idea for a piece, or, it might be, a few lines from a song or a book, the memory of a smile from an imaginary film, which became entwined in my nearly-dreaming brain with, say, a discussion of the relative methods of octopus preparation, complete with recipes. I remember once, in the drifting minutes between the first alarm and the final waking, composing a song which was also a pie, a very fine pie, and am still rather disappointed that I have forgotten the details, which, come to think of it, are probably non-existent and at any rate impossible. The problem is that, between work, a demanding puppy, and the cold and the dark, I am really quite exhausted, and I can see why most food writers confine themselves, in December, to the production of lists of various kinds, or to a retread of festive tropes providing twists on seasonal classics. Now, I can see why these are useful, if you have a lot of parties in December (as apparently people do), or indeed if you work in a restaurant, and wish to serve people something other than a bulked-up Sunday roast, over and over again. Personally, though, I feel a little sorry for anyone who feels that they need to constantly change the Christmas meal itself, to fall in with fashion or diets or simply for variety’s sake. Surely the point of such meals is that they are always, by and large, the same – like listening to the Fall, or reading PG Wodehouse. If I was at home for Christmas (‘home’ in this context always being where your parents or the majority of your family live) I know that on Christmas Eve there would be shepherd’s pie with braised red cabbage and mulled, perhaps blackberry wine, with a treacle tart to follow (or is that New Year? Maybe it’s warm mince pies), a warm hug after standing in the cold for the carol service; Christmas dinner means soup, a leg of pork, long chipolatas wrapped in good bacon, stuffing balls, slightly overdone sprouts, sneaky parsnips to be picked out of the roast potatoes, proper gravy and all the rest; it means Christmas pudding and ice cream, mint chocolates, nuts, fruit, the yearly indulgence of coffee with cream in it, and the rest of the day spent dipping bread in gravy every time you walk through the kitchen. The soup might change from year to year; an extra piece of meat might come out, or the veg vary depending on what is left of the allotment in the freezer, but the essentials remain. I won’t be at home for Christmas itself, this year, so we can do what we like. I think a salt cod and potato pie for the night before, and maybe a game-hung five year old hen, perhaps pot-roasted, for the main event. If it ends up tough and stringy, as well it might, considering I have never cooked one before, then at least we have the trimmings, which are after all the best bit. Whatever our romantic notions of European peasant cuisine might be, they almost certainly don’t include enough gruel. Those delightfully thrifty offal dishes you choke down at street stalls and in little backstreet diners? Before urbanisation and centralised slaughterhouses, they were once-a-year treats, the only freshly steaming meat you’d ever eat. Fresh, seasonal fruit and vegetables? Aside from the fact that raw fruit was once considered actively harmful to health, the juvenile state we eat most of our produce in is simply wasteful, a poor use of energy and time. A young pea straight from the pod is delightful, but that’s because it is mainly sugar; leave it on the plant long enough, and you have a suitably starchy pulse to see you through the winter, as a break from, yes, your gruel. 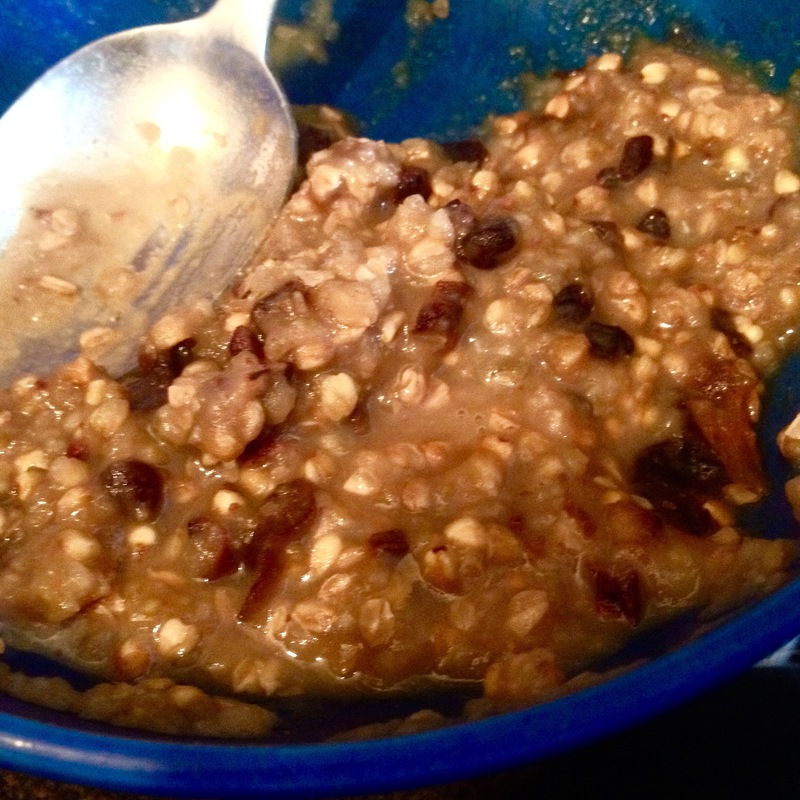 You can make gruel from any grain or pseudo-grain you like, ground or not, or even chestnuts. Before corn and therefore polenta came to Italy, and a long time before mechanisation made pasta a staple dish, the peasantry lived or at least survived on porridges of either buckwheat or chestnut flour; this is something you seldom see in modern temples to the cucina povera, for some reason. In Britain porridge tends to mean a sweet gruel, and it tends to mean oats, which collapse quite well into creaminess, especially with the addition of cream. The true Scottish way is to eat it with salt alone, of course – and maybe a tot of whisky. As I say, though, oats can take such meagre treatment; most other porridges need some sort of enlivening. I don’t know how long you could live on plain chestnut porridge alone, but it would certainly be long enough to wish you didn’t. Congee, the Chinese rice porridge, sounds a little more appetising, but that might be because the last recipe I read for it emphasised that it should be made with a good chicken stock; given that I would happily drink a good chicken stock by itself, this is hardly a fair comparison. A good white risotto is essentially a rice porridge, but again, that is enlivened with not just stock and wine but also large amounts of cheese and butter; given that I would happily … But I repeat myself. I have always thought of porridge as quite a primitive thing, a slight misstep on the way to making bread, though I suppose it has just followed a parallel path. On the one hand, it is quick to make, and doesn’t need an oven; on the other, it requires a good metal cooking pot, a comparatively advanced piece of technology. The pernicious wheatphobia of the clean eating brigade has, anyway, led to a resurgence in the popularity of porridge, often made with so-called ancient grains, many of them varieties of wheat. I am currently eating a porridge made of buckwheat – which, despite the name, is actually a relative of rhubarb – not because I am avoiding gluten but because I like buckwheat, though not, it turns out, enough to enjoy eating it as a gruel, even with the addition of prunes and malt extract and various other favourite things of mine. Perhaps it needs a good chicken stock, or at least a slick of cream; perhaps eating gruel just isn’t supposed to be enjoyable. Perhaps for lunch I will eat something crunchy, and thank the stars I am not a medieval peasant, eating three bowls a day.